This chicken is everything! It’s just what you need on a weeknight when you don’t know what to do with the chicken you defrosted and you want to eat dinner NOW! You don’t have to marinate it way in advance either. Just ten minutes will do the trick, then you’re good to go. I make this chicken on a grill pan, because the charred lines make it taste even better, but a simple frying pan will do just fine. Just mix everything up and leave the chicken to marinate while you make a salad or set the table. Then heat your grill pan on a medium heat, when it’s hot add a little oil and grill the chicken, turning only when each side has a beautiful set of charred lines. I serve this chicken with some delicious falafel, hummus, fattoush and pita bread. I sometimes alternate this recipe with my lemon oregano chicken. Both are delicious, but this one seems to be my favourite nowadays! As promised! Here’s the recipe for Lemon Oregano Chicken. It tastes best when it’s grilled, but you can’t bbq all year round, especially when it rains for weeks at a time (ahemgermanyahem) so all you need is a grill pan. You know the square pan that’s really heavy and has lines on it so you can get the grilled look, and most of the taste too! 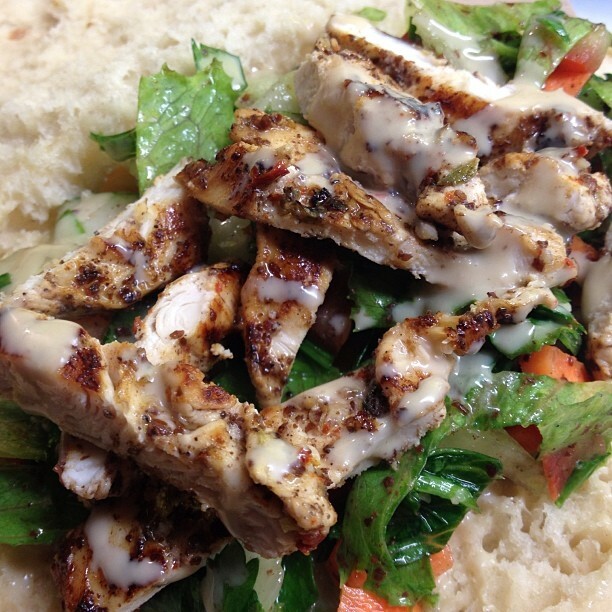 The combination os pita bread, fattoush, this chicken and hummus or tahina is just ahhhmazing. Please try it all together. It’s worth it! All you have to do is marinate the chicken in all the ingredients for at least 5 minutes. You don’t have to add the cayenne pepper, but it adds a nice punch of spice! Just grill the chicken for about 5 minutes on each side, and eat it as quickly as possible! You can make a pita pocket as well! Just fill the pita with fattoush, chicken, and hummus. If you don’t have all the ingredients for hummus you can just add some tahina paste (sesame seed paste) and you’re good to go!